Jeff Bucknum was born with racing in his blood. His father, Ronnie Bucknum was the first driver to run a Honda powered engine in F1. Ronnie was also a veteran of the Indy 500, running the 500 from 1968-1970 with a career best 15th place finish in 1970. But racing was second to surfing for Jeff in his younger years. “I grew up along the coast of California so I spent most of my life growing up surfing.” Jeff said of his teenage years. “I did the whole surfing contest thing even surfing on a professional tour just out of high school.” He recalled. At the age of twenty, Jeff broke his ankle in a surfing accident, and was away from surfing for a year. In that year, he did some thinking about his future. “It was at that time I decided I really wanted to pursue a racing career. My dad helped me with my karting career on a full time bases until he passed away in 1992. After he passed it was hard to keep going at first but I decided one day that he would want me to give it my best shot. That’s when I signed up for the Skip Barber Racing School at Sears Point Raceway and began racing cars.” Jeff said on the decision. His father passed away from complications due to diabetes. He began at Skip Barber Racing School in Sonoma, California. Jeff made his Indy Car debut at the 2005 Indianapolis 500 running for Dreyer and Reinbold Racing. 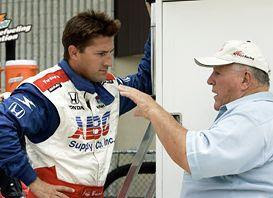 Team owner Robbie Buhl, who was a driver coach at the Barber Racing School, struck a deal to drive the 500, and test cars on road courses, as well as run the Japan Indy Car race, ran prior to the Indy 500 that year. “I flew to Indy to meet with Dennis Reinbold and Robbie, and within a few weeks we struck the deal.” Jeff said. Jeff was teamed with Roget Yasakawa and finished 22nd in Japan after a first lap incident and duplicated that run by finishing 22nd in the Indy 500, and he was collected in Danica Patrick’s spin under yellow. Jeff later that year signed to drive for A.J. Foyt Racing. Ironically, his first Indy Car road course start would be at the track he learned it all from, Infineon Raceway in Sonoma California. Jeff didn’t disappoint, finishing tenth. Jeff made his final start of the season at Watkins Glen, bringing home his A.J. Foyt Racing #14 in the eleventh position. “Racing for A.J. Foyt was a great experience for me. We didn’t have the same budget as the big teams, but my background is road course racing so it went fairly well. It was fun running my first Indy Car road course race at the same track I drove my first race car, which was Infineon Raceway (Sears Point Raceway). We finished 10th which was the best finish Foyt racing had that year.” Jeff recalled. When the 2006 season started, Jeff was again searching for a ride. Jeff landed at Hemelgarn Racing to team up with P.J. Chesson to run the Indy 500. “I had a really good relationship with the Hemelgarn Team going into the 2006 Indy 500. As a matter of fact the engineer and a few crew members that worked with me at Hemelgarn worked on my car the year before when I raced for Dreyer and Reinbold.” The result of the 500 was not what Jeff was looking for as he was collected with teammate P.J. Chesson after the second turn on lap one, resulting in a 32nd place finish, which added to the fire that was already started. “I would say things weren’t any worse after the race then they were before the race with P.J. I think P.J. is not much of a race car driver as he is a fan of himself. He and I didn’t get along well because I wanted to be at Indy to race and he wanted to be at Indy to be recognized. I was a threat to him because he knew I could always out -perform him on the track." The one race deal with Hemelgarn left Jeff ride less, but a call from A.J. Foyt found Jeff again back behind the wheel of the #14 ABC Supply Co. car. Jeff replaced Felipe Giaffone have way during the season to run Nashville, and the remainder of the races, finishing 13th at Milwaukee and Kentucky as his best runs. Jeff competed in this year’s 24 Hours of Daytona event for Stevenson Motorsports in a Pontiac GT car. Running 3rd with just an hour to go, a half shaft broke on the car resulting in a 6th place finish. Jeff and wife Suzanne have three wonderful kids, Spencer, Ashley and Dylan. Jeff is still a big fan of the series and the Indy 500, and although he doesn’t ever rule out a return to run the 500, he is mainly focusing on his racing career in sports cars.